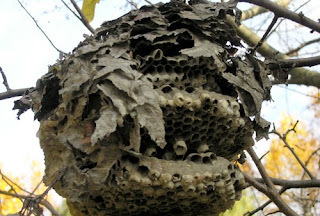 All summer the wasps' nest hanging near the driveway intimidated us. Big, papery, lumpy, and gray, it was the source of constant waspy motion and potential injury. Or so we thought. It turned out that the wasps kept pretty much to themselves, preferring the company of whatever they keep company with. Now, after days of rain and nights of frost, the private outer cover has melted away, and we can see the intricacies of what they built and busily inhabited. Where did they all go? Do wasps migrate? Are they intense, skinny fellow-travelers with the butterflies, agitating the southward journey with their angular noise? Or do they lie, frail, dry and wispy, in the corners of barns and old sheds? In either case, I am grateful for this quiet, fragile husk.